If you're new to Photoshop, you might find the menus to be a bit confusing. With this guide, you'll learn where each menu is located, and what tools are contained within, as well as a brief explanation about what each tool set does. 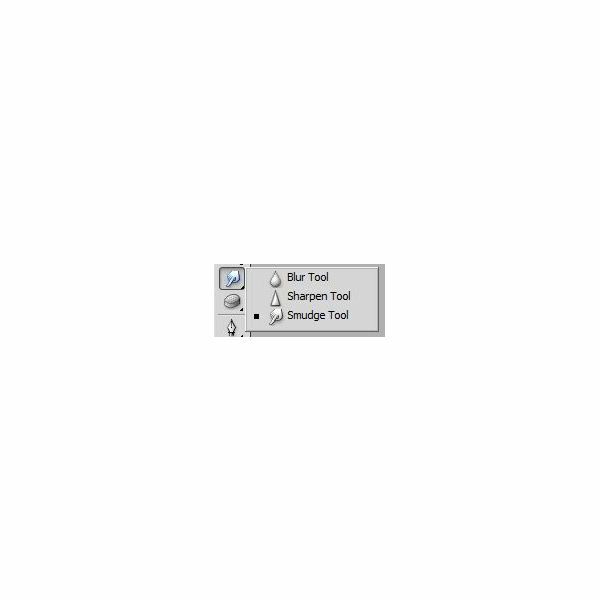 Lasso tools allow you to select objects with your mouse or graphic tablet. This secton includes the lasso tool, the polygonal lasso tool, and the magnetic lasso tool. 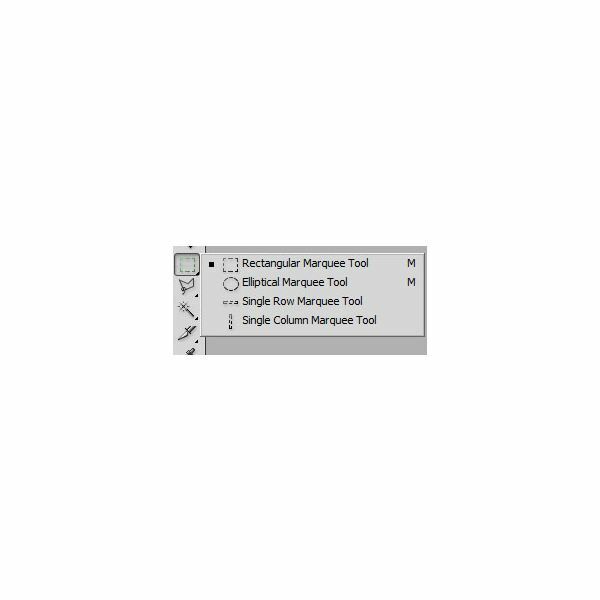 Marquee tools are special tools that are designed to make selecting parts of your document easier. This section includes the rectangular marquee tool, the elliptical marquee tool, and the horizontal and vertical pixel select tools. The magic wand and quick selection tool offer quick ways to select parts of your document quickly and with decent accuracy. The Slice tools are a great way to slice websites to import into Dreamweaver, this section contains the crop tool, slice tool, and slice select tool. Eyedroppers allow you to select colors from your pallet and set them to your foreground and background colors. Within this menu are the eyedropper tool, color sampler tool, ruler tool, and note tool. Patching/Healing tools work fantastic for one click fixes of red eye, blemishes, stray hairs, and photo damage. 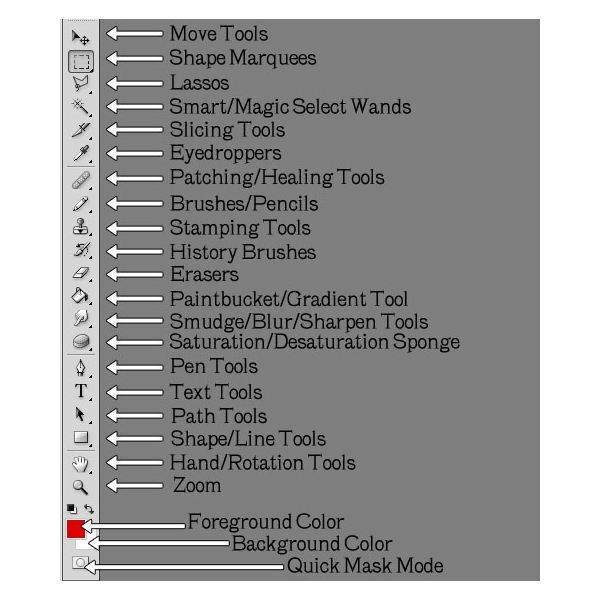 Contained within this menu are: spot healing brush tool, healing brush tool, patch tool, and red-eye tool. The brushes and pencils allow you to quickly and easily draw, sketch, and paint as needed on your document. Included here are the brush tool, pencil tool, and color replacement tool. Stamping tools work a lot like patching and healing tools and are fantastic for image correction. Here we have the clone stamp tool and pattern stamp tool. 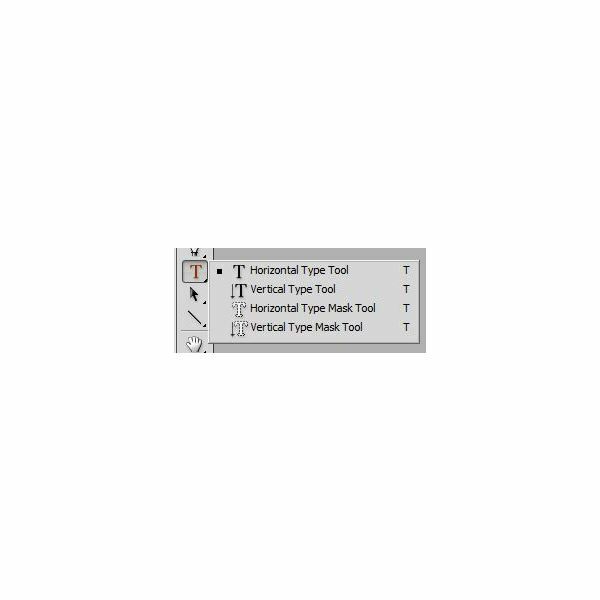 History brushes allow for you to return parts of the document to its original state without having to undo everything you've done. 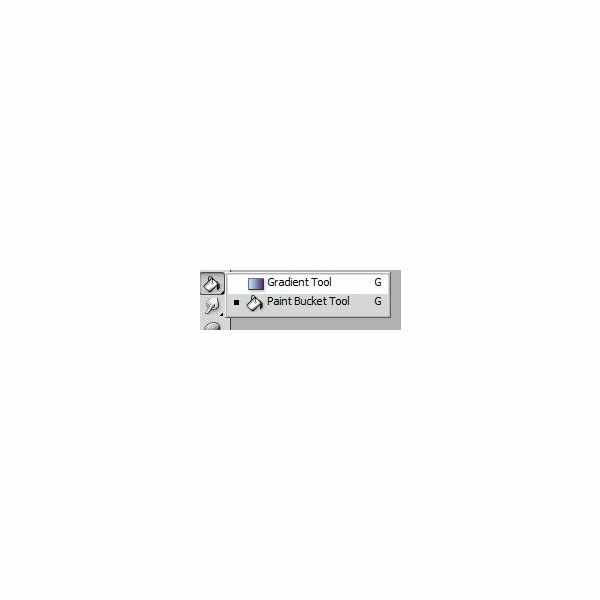 Included in this menu: history brush tool, art history brush tool. Erasers allow you to easily erase parts of your document for correction. This menu includes the eraser tool, background eraser tool, and magic eraser tool. The paintbucket tool and the gradient tool can be found within this menu, and are great for filling in large chunks of your document, and also for adding great gradient effects to your projects. The smudge tool, blur tool, and sharpen tool are the next three tools you'll find, all of which apply filter like effects without having to apply them to the full image. Simply brush the effect on where you want it! Sponge tools offer some fantastic abilities to alter the brightness and contrast of your projects. These tools include the dodge tool, burn tool, and sponge tool. Pen tools help you to easily create lines and shapes with precision and speed, though they're a bit tricky to work with at first. 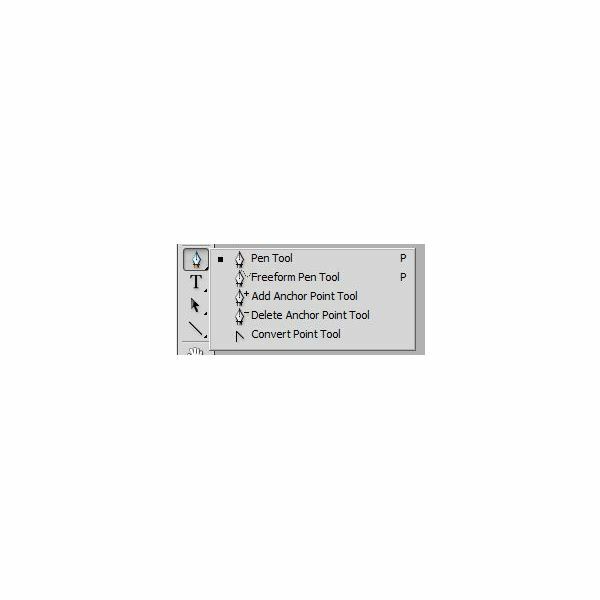 This tool menu includes the pen tool, free-form pen tool, add anchor point tool, delete anchor point tool, and convert point tool. Type tools allow you to add text to your project and manipulate it to fit well within its surroundings! The type tools included are the horizontal type tool, vertical type tool, horizontal type mask tool, and vertical type mask tool. Path tools allow you to select existing paths you make with the shape or line tools and manipulate them to fit your needs. This menu includes the path selection tool and the direct selection tool. Shape/Line tools make creating solid shapes, shape paths, and line and line paths. This great menu features the rectangle tool, rounded rectangle tool, ellipse tool, polygon tool, line tool, and custom shape tool. Hand/Rotation tools allow you to easily move your project around. This menu contains the hand tool and the rotation tool. All images and references from the author.